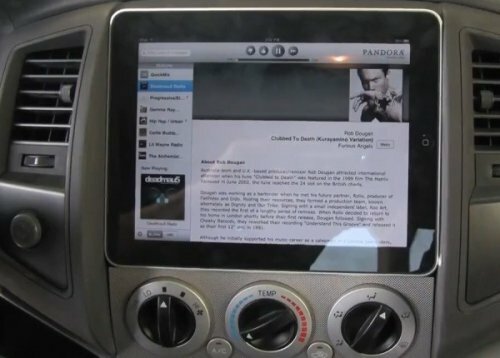 Doug Bernards of SoundMan Car Audio in Santa Clarita, California is the first to install an iPad in a car. The car of choice? A Toyota Tacoma pickup. You can check out a video below. They still need to wire it up to the Audison Bit One sound processor and McIntosh MMC406M 6-channel amp, but they’ve fitted and molded the dash to the iPad. Sure it looks a tad awkward with it’s size and that bezel, but all of your media will be along for the ride right? The Sony Dash “personal internet viewer” is finally available for pre-order directly from Sony. It will cost you $199 and it’s good that you get one now while you still have money, because Sony will be shipping them out “on or about” April 15th at which time you will be short on cash. We were not very excited about this one until we learned that it could stream shows and movies from netflix. Now we like it a whole lot more. All things considered, it should be worth the asking price. Sure, we’ve heard it all when it comes to Ford jokes. Found On Road Dead, Fix Or Repair Daily, etc. Say what you like about Ford, you can’t deny the coolness of their SmartGauge LCD panels in their new 2010 hybrids. Instead of the usual boring analog dials, Ford gives you a LCD screen cluster and even some animations. Notice the fuel gauge. Nice to look at, easy to find and functional. The best part about using an LCD display is that it’s fairly customizable. You can display battery charge, GPS and Satellite radio coverage, maybe even current mp3 track information. Of course there’s the usual boring MPH and RPM indicators. They just don’t look boring.